I’m always surprised that someone is full of so much rage that an incident on the road would cause this kind of reaction. Sure, we’ve all fantasized about what we would do in that sort of situation and that fantasy is usually enough for me. 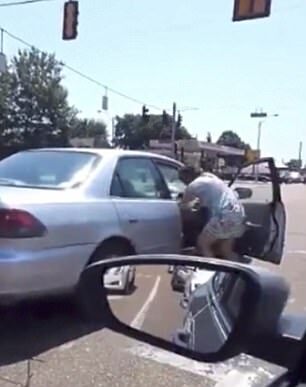 It was not enough for this lady who was caught on video attacking the driver of another car. An inconspicuous bystander spotted a woman yelling with the driver of a car stopped at a red light and decided to film the encounter. The angry woman kicks into the car yelling “shoot me b***’, shoot me hoe!” multiple times as she repeatedly tries to injure the driver of the car. The driver of the car was a feisty woman and she defended herself admirably by getting the assailant out of the car at one point. At this point, the attacker became even more upset and stood up on the bumper of the passenger’s side door and stomp kicked the driver multiple times. When the light changed to green, the driver of the car tries to speed off to disrupt the incessant barrage of stinky foot blows to her body. The force of the acceleration was enough to discharge the assailant from the car. At this point, the bystander who was filming the encounter had to start driving to keep the picture in frame. As the driver speeds up to catch the perpendicular view of the attacked car speeding off in the distance, all that is left to see is this crazy person running like a mad woman after the car, intent on causing bodily harm to the driver of the car. Clearly, she was a crazy person who was off of her meds or something. Check out the footage for yourself and see what kind of crazy people we have living on the streets with us normal people. It is currently unknown where this footage was taken and we still do not know who this crazy person is. This is a public service announcement that there are random people on the street who will attack you in your car for no apparent reason, so watch out. Now that I think about it, we don’t know the entire story. This lady could have spotted the woman who her man was having an affair with and decided to go ape on her in broad daylight. She could’ve had a Trump sticker on the car and this lady has been fed so many lies that she decided to snap on the first Trump voter she saw. Anything is possible.